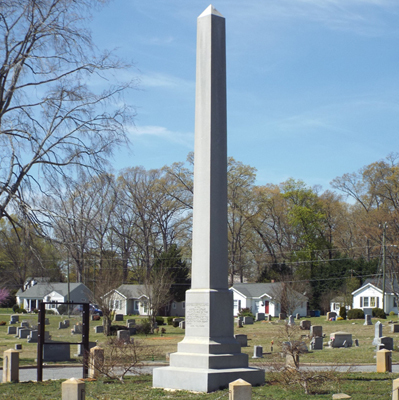 The monument is a granite obelisk standing 25 feet tall on a multi-tiered base. Inscriptions appear on two sides of the largest, upper base block. The monument is encircled by 14 granite post, six feet apart and connected by a bronze chain. The bodies of four Belmont men who died in the war were moved to site of the monument and were honored at the dedication. Four small grave markers with the initials of the dead are set on each side of the obelisk. Although the inscription is dated August 15, 1922 the dedication ceremony was held on August 27. Front: WILLIAM A. AUTEN, / PVT. 1 ST . CL. CO. C., 318 TH / MACHINE GUN BN. 81 ST . DIV., KILLED IN ACTION / NOV. 10, 1918. / CHARLES G. STOWE, / PVT. 1 ST . CL. CO. C., 167 TH / INF. 42 DIV., / KILLED IN ACTION / SEPT. 26, 1918. / MELVIN A. WARE, / PVT. U.S. ARMY / DIED IN THE SERVICE / OCT. 21, 1918. / LONNIE G. WALTERS, / SEAMAB 1 ST CL. U.S.S. NEVADA / DIED IN THE SERVICE / JULY 14, 1919. At the late Sunday afternoon ceremony, Herley P. Gaston who represented the fundraising committee presented the monument to the community. It was accepted on behalf of Belmont by Professor F.P. Hall. Kale Burgess, adjutant of the North Carolina Department of the American Legion was the keynote speaker. The monument was unveiled by Miss Ruby Ware, the eight year old sister of one of the men to whom the memorial was dedicated. The unveiling was followed by the sounding of taps and the playing of the "Star Spangled Banner." The Auten-Stowe American Legion Post was named in honor of two Belmont men killed on Flanders Fields in Belgium and who are buried at the base of the obelisk. 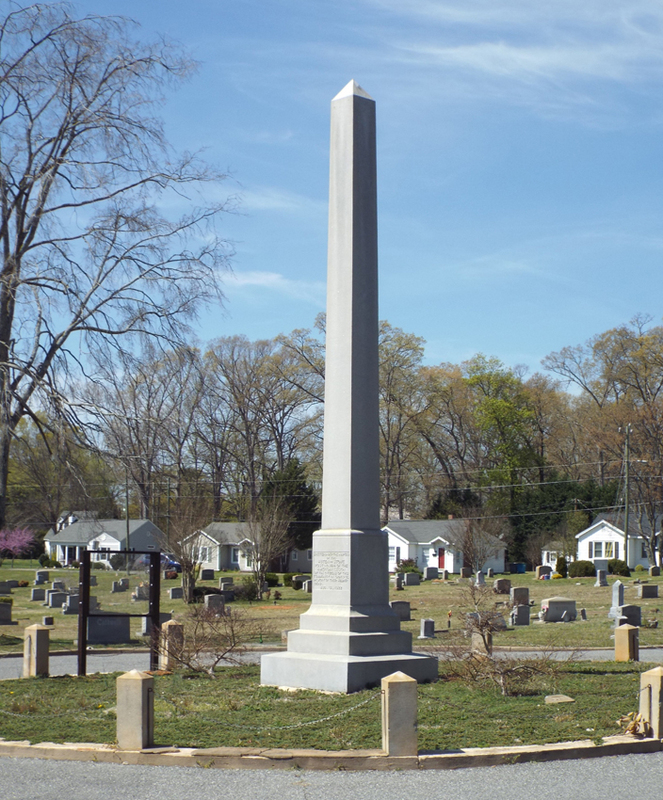 The monument is located in the circle in the center of Greenwood Cemetery located on the 400 block of South Main Street in Belmont. The memorial obelisk is surrounded by tombstones.